Signed, Sealed, Delivered: From the Heart – mystery fun for the whole family! I have to say that I really enjoy the Signed, Sealed, Delivered movies! I think they do a great job to give a great mystery, romance, and faith-filled moments that make you reflect. I love that they’re consistent with the values presented in each of these Christian DVD. 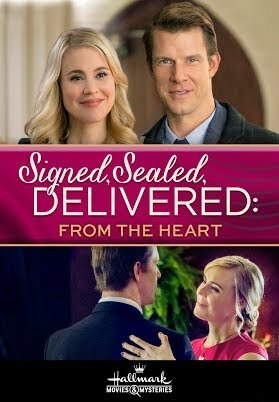 Signed, Sealed, Delivered: From the Heart tells the story of how the postables, Norman, Rita, Shane, and Oliver find a 200-year-old valentine letter that could change history’s course while also investigating a letter that could change the life of a specific public figure. Also, these 4 friends deal with their own heartbreak during Valentine’s day. The Christian DVD Signed, Sealed, Delivered: From the Heart begins with a kind of flashback to more than a hundred years back, Valentine’s day 1835 to be exact and there’s a woman named Ann Rutledge who writes a love letter to the man she loves. But it’s not just an ordinary man, she writes to General Abraham Lincoln. Now that’s a story with a catch, right? Then we go back to present time, just a few days before this romantic holiday and we see Oliver who is striving to make the best Valentine’s day card for Shane. After some time working on it, he gives the card to another colleague named Hazel and gives her some clear instructions. To be discreet and to be sure to give the card to Shane on Valentine’s day. Later on, Shane gives Oliver a card that needs some investigating on. By reading the letter Oliver notices that it tells the story of two high school students named Ryan and Maddie, they are members of opposing debate teams and the letter seems to be about 15 years old. In this letter, Ryan makes kind of a confession that catches Oliver’s attention for sure. What’s going on with Rita and Norman from Signed, Sealed, Delivered: From the Heart? Well, they are planning their Valentine’s day but soon those plans go out of the window when Rita is chosen Miss Special Delivery at work so those plans have to be put on hold for now. At the same time, Norman receives a box filled with old valentines from his cousin Serge. To their surprise, inside this box, they find Ann Rutledge’s letter (which is shown at the beginning of this Christian movie). So as Rita heads to her responsibilities and events as Miss Special Delivery, Norman hangs on to the Rutledge letter. On the other hand, Shane is really not looking forward to the upcoming holiday and she really doesn’t think Oliver will ask her out or take her to dinner. Remember what I mentioned about the letter Oliver was reading and how he read a confession? Well, it turns out that Ryan, the boy from the letter, accidentally killed a homeless man in a drunk driving debacle. So Shane comes in to try to link the accident with a date and Oliver mentions that he himself is connected to the letter. Soon in one of the events Rita has to be a part of, she denies having a boyfriend trying to avoid any type of scrutiny but little did she know that poor Norman was watching. This obviously breaks his heart and later he confronts her over a phone call. She tries to explain her reason for denying their relationship to the public but he just doesn’t understand still. Basically, this dilemma between Norman and Rita remains unsolved and after speaking with her Norman decides to read the Rutledge letter for the first time. At this point Shane from this Christian DVD has done some research on Ryan’s letter and finds some info about his legal record and why Maddie didn’t have a forwarding address. In terms of finding info about Maddie, Shane tracks down her debate partner who actually gives her plenty of information to track down Maddie. Turns out she is in a local hospital and is being treated because of a congenital heart defect. The postables know that they have to deliver Ryan’s letter, it was in fact meant for her but at the hospital, they are denied entry to Maddie’s floor. So now they use another strategy, they track down Ryan who actually agrees to deliver the letter himself. What events will occur regarding the Rutledge letter? Will Ryan be able to deliver the letter? What will happen between Norman and Rita? Shane and Oliver? Purchase the Christian movie Signed, Sealed, Delivered: From the Heart and find out!